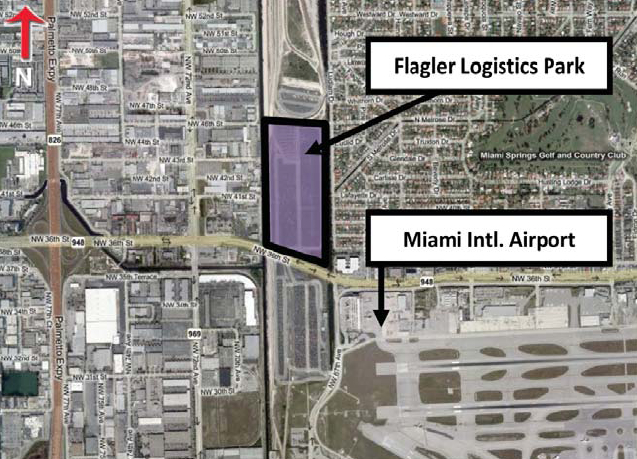 One of the newest industrial parks in Miami will be Flagler Logistics Park. The 60 acres site is located off NW 36th Street and 72nd Avenue near the Palmetto and Dolphin Expressways. It’s close proximity to these expressways and Miami International Airport is a big selling point for the park. In addition, the property is rail-served by FEC railroad. Expect over 1,000,000 square feet of industrial warehouse to be constructed there eventually. The property is represented by Flagler Real Estate Services. ComReal represents The 7000 Building located nearby in Commerce Park at 7000 NW 33rd Terrace, Miami. This 127,000 sq. ft. warehouse in Miami already exists and is rail served by FEC railroad. The property is for sale or lease. Special features include: all concrete construction including roof; fully sprinklered; heavy electric; extra trailer parking and/or storage; concrete mezzanine; over 12,000 sq. ft. of office space; dock height loading and ramp; high ceilings and more. Visit www.miamiairportwarehouse.com. For more information on other Miami warehouses and the Miami industrial real estate market in general, please contact The ComReal Miami warehouse team at 786-433-2380. Flagler Logistics Park has been renamed to South Florida Logistics Center. Construction of Building I is expected to commence shortly.